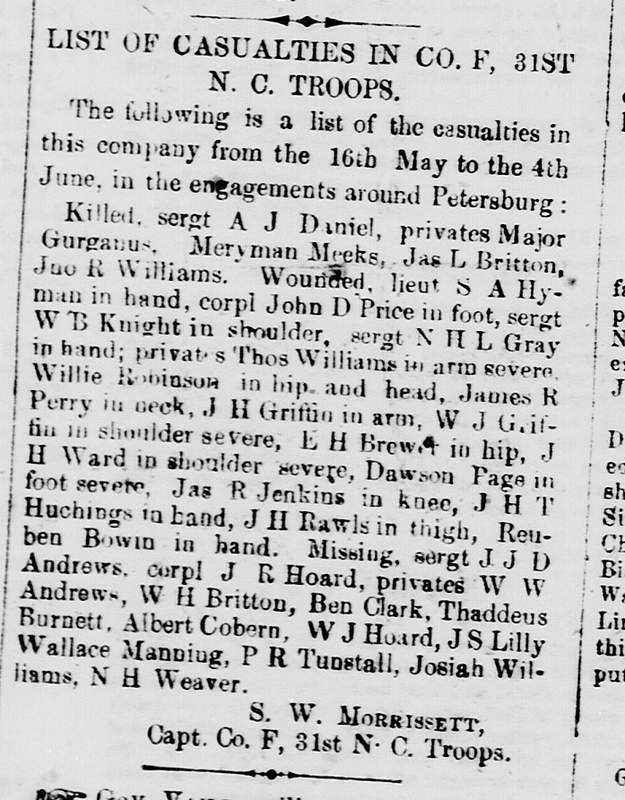 LIST OF CASUALTIES IN CO. F, 31st N. C. Troops. Killed, sergt A. J. Daniel, privates Major Gurganus, Meryman Meeks, Jas. L. Britton, Jno. R. Williams. Wounded, lieut S. A. Hyman in hand, corpl John D. Price in foot, sergt W. B. Knight in shoulder, sergt N. H. L. Gray in hand; privates Thos. Williams in arm severe, Willie Robinson in hip and head, James R. Perry in neck, J. H. Griffin in arm, W. J. Griffin in shoulder severe, E. H. Brown in hip, J. H. Ward in shoulder severe, Dawson Page in foot severe, Jas. R. Jenkins in knee, J. H. T. Huchings in hand, J. H. Rawls in thigh, Reuben Bowin in hand. Missing, sergt J. J. D. Andrews, corpl J. R. Hoard, privates W. W. Andrews, W. H. Britton, Ben Clark, Thaddeus Burnett, Albert Cobern, W. J. Hoard, J. S. Lilly, Wallace Manning, P. R. Tunstall, Josiah Williams, N. H. Weaver. Capt. Co. F, 31st N. C. Troops.